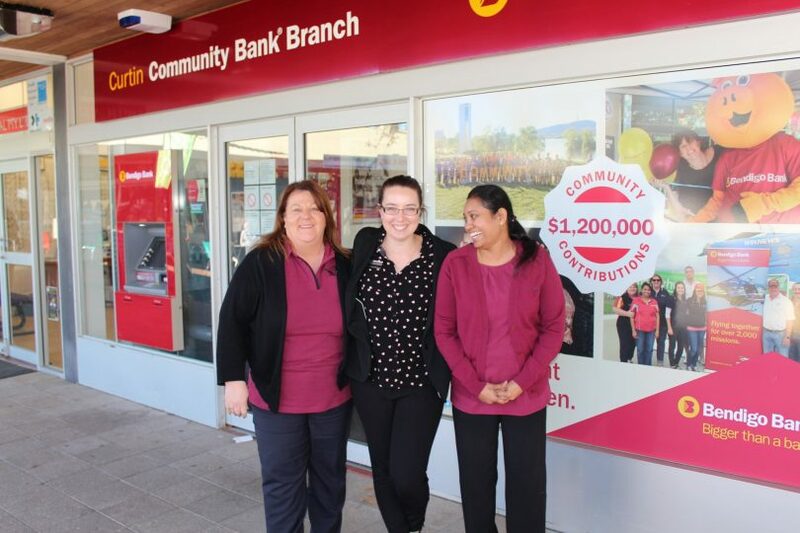 Curtin Community Bank® branch of Bendigo Bank has just celebrated their fifth birthday, awarding five $500 grants to local not-for-profit organisations. Chloe Heath, branch manager at Curtin, remembers the day they cut the ribbon and opened the doors back in June 2012. She was working for the regional office in Canberra at the time, and the Curtin community was in uproar after the Commonwealth Bank had just closed down (as had happened with so many others in Tuggeranong). Viola Kalokerinos, who was named ‘Queen of Curtin’ last year, spearheaded a campaign alongside local community leaders to raise funds to open a Canberra Community Bank® branch. The branch would provide all the services of a normal bank via Bendigo Bank, but still be owned and run by the local community. Chloe, who has been with Bendigo Bank for over 10 years, recounts that it didn’t take long for the campaign to come to fruition. Within a year the branch was opened and staffed, and five years later it’s a much loved part of the Curtin community. “We wanted to do something special for turning five, so we organised a celebration on June 5 to give away five $500 grants to local not-for-profits. Once we put the word out we received around 10 nominations, and then let the community choose the five winners via a Facebook poll. Winners included Integra Service Dogs Australia, Australian Dance Party, Mystery Bells team for Mystery Box Rally, Canberra District Historical Society and Lake Burley Griffin Sea Scouts. Giving back is not a one-off event for the Curtin Community Bank®. As part of their charter, all four of the Canberra Community Bank® branches (Curtin, Wanniassa, Calwell and Jerrabomberra) return 80% of their profits back to the local community through donations and sponsorships. Of working for such a philanthropic organisation, Chloe says “Like the fifth birthday, we tend to look out for smaller organisations as they’re generally overlooked but often the ones that benefit the most. Being part of a socially responsible company makes a big difference in my own life – particularly knowing that the reason we make money is so that it can be invested back into the community. Bendigo Bank has won a heap of awards recently, including the Mozo People’s Choice, where it won in all eight sub-categories (including customer satisfaction, customer service, most recommended and highly trusted). Chloe says her favourite product at the moment is the Connect Home Loan range which rewards customers for banking with Bendigo by offering reduced interest rates on credit cards, home loans, insurance, and so on. For those interested in moving their banking to the Canberra Community Bank® Group, Chloe says it’s really easy now thanks to the banking reform. Simply visit the branch and tell them what you need. From there they do all the hard work, and you only need to go back to your old bank to close your accounts. For more information about Curtin Community Bank® branch, call 6260 5140 or pop in to see them in the Curtin shopping plaza (Curtin Place, Curtin).